JALWA USA 2019 REGISTRATIONS FULL! Participant can only have ONE entry per category. All participants should be residents of the United States of America. The same set of rules will apply for all the participants of all ages. Application fees are non-refundable and will not be refunded under any circumstances. Group Dance should have a minimum of 3 participants and maximum of 16 participants. Couples category is a special category in which there is no age or separate (Classical/Non-classical or singing/dance) categories. All couples entries will compete for a single trophy. Couples category participants will all be judged all together in one category and not based on age. Couples category participants can be of any age e.g. Mother-Daughter, Siblings, Husband-Wife, Friends etc. Non-classical singing can be in any language including English. Music tracks for singing and dancing entries should be emailed to JalwaUSA@gmail.com NO LATER THAN 2 weeks before the event. Strict 3 mins time limit must be adhered to for all tracks sent (except 5 mins time limit for 13+ years Classical Solo &Group Dance and Adult Non-Classical Group Dance). Jalwa USA has the right to refuse participation to any participant for not following the rules of the competition or due to late arrival. Each participant must sign the Accident Waiver and Release of Liability form. 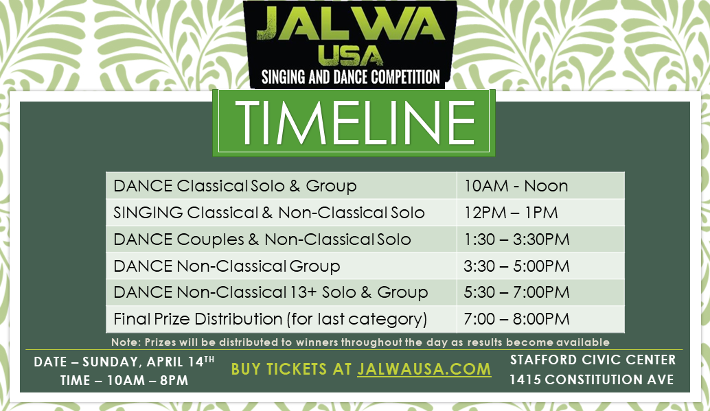 Each participant releases their rights to JALWA USA on video footage and pictures collected during and in connection with the JALWA USA competition.